The last of the bye weeks is upon us and that means no Panthers or Steelers players this week. 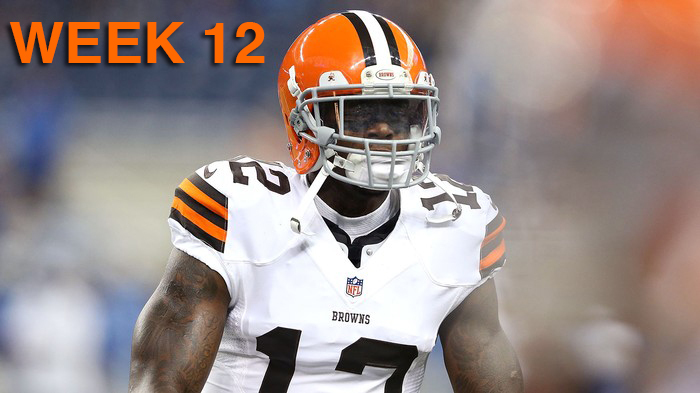 Week 12 also means that you likely have only 1-3 weeks left in your fantasy regular season. Where did the time go? It’s hard to believe that we’re 3 months into the season. It’s also hard to believe that the Raiders beat the Chiefs this week (notice the smooth segue there). Few saw that coming including Michael Fabiano from NFL.com who incorrectly picked the Chiefs to win. The good news is that if you haven’t entered your picks in this week’s Beat the Expert contest, you still have a clean slate to beat Michael. I’m sending one lucky winner to any regular season NFL game of his/her choice! That could be you! There are a number of great matchups this week which is why I’m recommending guys like Jay Cutler, Tony Romo, CJ Anderson, Coby Fleener, and my Green Bay Packers defense in this week’s Sit/Start column. If you stashed Josh Gordon like I did, there’s no reason not to plug him into your lineup…well, except for the fact that he’s been selling cars instead of running routes with his team. When Gordon returned from suspension last year, he torched the Vikings for 10-146-1. I can’t predict the future, but he’s such an elite talent that I’ll be surprised if Gordon doesn’t perform at WR2 levels with WR1 upside even in his first game back. The guys that I’m sitting this week include Larry Fitzgerald, Andre Johnson, Philip Rivers, and RGIII. If you picked up Jonas Gray from the Patriots, think before you rush to plug him into your lineup. Unlike the Colts, the Lions interior is brutal to running backs so any expectation of Gray being able to run all over them should leave your head immediately. He won’t come close to repeating last week’s crazy performance. In fact, I wouldn’t be surprised to see Vereen have a bigger fantasy day particularly in PPR formats. One of the guys that hasn’t had a single crazy performance this year but that I’m still watching this week is Trent Richardson. With Bradshaw out, TRich should see a very healthy workload, but even with volume, his 3.4 yards per carry doesn’t always equal fantasy goodness. I’ll also be watching two player movements. Ben Tate was released from the Browns and picked up by the Vikings, and LeGarrette Blount returns to the Patriots after being released by the Steelers. I’m not sure I’d rush out to pick up either guy, but it will be interesting to watch them nonetheless. If you play any of the daily fantasy games and are looking for some sleeper value picks, consider Mark Sanchez, Brian Hoyer, Colin Kaepernick, Josh McCown, Shane Vereen, Steven Jackson, Isaiah Crowell, Vincent Jackson, Cecil Shorts, Niles Paul, or even Austin Seferian-Jenkins. All have great value for where the major daily fantasy sites have them priced. On the injury front, we’ll be watching the status for guys like Julius Thomas, Arian Foster, Lamar Miller, Jared Cook, and Reggie Bush. As a reminder, if you are a Premium member of FFN, sign up foriAlerts, enter your teams into the Lineup Analyzer, and we’ll alert you via email or text message if any of your players are marked Inactive. If you don’t hear from me before next Thursday, I hope your Thanksgiving is enjoyable! If you’re traveling, good luck and stay safe.